JTP Non Ferrous supply all types of metal to all industries, educational establishments, utility companies and the Ministry of Defence. This is supplied in all shapes, forms and sizes and in all specifications of Brass, Bronze, Aluminium Bronze, Copper, Aluminium, Cast Iron, Stainless Steel, Mild Steel and Alloy Steels. We offer a next day delivery service for stock items using our own transport. We are committed to offering a service second to none and to supply quality products to our customer requirements. 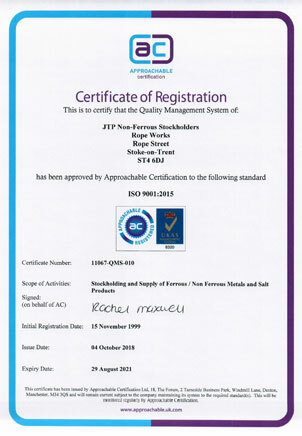 We can also supply certification for all materials.